It's the most wonderful time of the year...time to break out the panettone! Panettone is at the top of the Christmas "must-haves" list in an Italian home. If you have company coming over, you can bet that panettone will make an appearance on the table. ; or if you are visiting someone for the holidays, most likely you will be carrying a panettone in hand to offer your gracious host. Panettone comes in all shapes and flavours nowadays, but the original recipe, which hails from Milan, translated into a simple sweet bread sprinkled with raisins or candid fruit. The legend of this bread dates back to the 15th century. While there are various versions of it's origins, one story involves the Duke of Milan, Ludovico il Moro, and his cook. One day, the Duke had asked his cook to prepare a banquet for the himself and a small number of nobles. While the cook delivered a wonderful meal, he unfortunately forgot about the dessert in the oven, which ultimately burnt. The cook was devastated, so when the kitchen boy, Toni, suggested to use the sweet cake he had made, the cook agreed. The cake, which was made from flour, butter, eggs, lime zest and raisins, was a great success. When the Duke asked the cook for the name of the cake, he stated, "Pan de Toni," meaning, "the bread of Toni;" this eventually transitioned into the word we know today - Panettone. 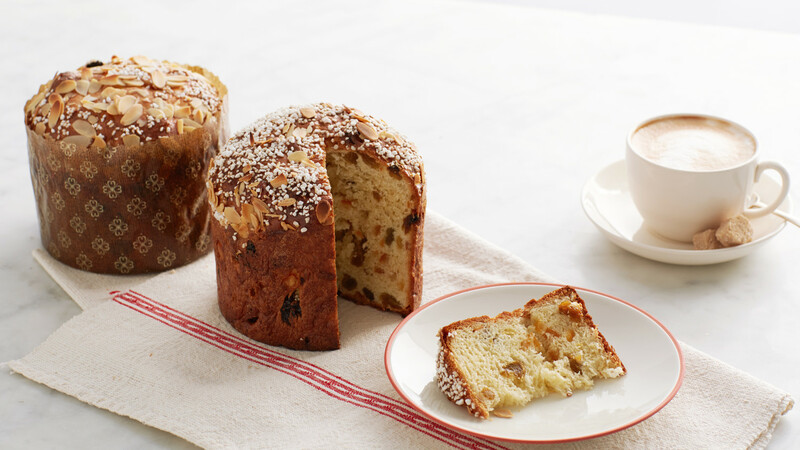 Panettone can be enjoyed in many different ways. For instance, I love to toast a slice of panettone and then spread either some butter or Nutella on it! Mmm...so delicious! Others like to dip their panettone in wine, or simply enjoy it alongside their coffee. Any way you have it, panettone is a delicious, traditional, Italian treat! How will you enjoy your panettone this Christmas? If you're not sure and need some ideas, check out the links below for some great recipes!